The Song Remains the Same film (also known as TSRTS) is a concert film by the English rock band Led Zeppelin. The recording of the film took place during three nights of concerts at Madison Square Garden in New York City, during the band's 1973 concert tour of the United States. The film premiered on 20 October 1976, at Cinema I in New York and at Warner West End Cinema in London two weeks later. It was accompanied by a soundtrack album of the same name. The DVD of the film was released on 31 December 1999. Promotional materials stated that the film was "the band's special way of giving their millions of friends what they had been clamouring for — a personal and private tour of Led Zeppelin. For the first time the world has a front row seat on Led Zeppelin." A reissue of the film, including previously unreleased footage, was released on DVD, HD DVD, and Blu-ray Disc on 20 November 2007, by Warner Home Video. John Henry "Bonzo" Bonham was an English drummer and songwriter, best known as the drummer of Led Zeppelin. Bonham was esteemed for his speed, power, fast right foot, distinctive sound, and "feel" for the groove. He is widely considered to be one of the greatest drummers in the history of rock music by other musicians and commentators in the industry. Bonham was born on 31 May 1948, in Redditch, Worcestershire, England, to Joan and Jack Bonham. He first learned how to play drums at the age of five, making a drum kit out of containers and coffee tins, imitating his idols Gene Krupa and Buddy Rich. John Bonham died at the age of 32 on September 25, 1980, resulting in the end of Led Zeppelin for nearly two decades. John's sister Deborah Bonham (rock and blues vocalist) and John's son Jason Bonham (drummer) have found success unassociated with their famous relative in the music industry as well. Jason Bonham has also performed in his father's role as Led Zeppelin's drummer, most notably on December 10, 2007 during the Ahmet Ertegun Tribute Concert. The "tribute concert" was Zeppelin's first full-length concert since the death of John Bonham. Folk singer Jake Holmes wrote and recorded Dazed and Confused for his debut solo album "The Above Ground Sound" of Jake Holmes, released in June 1967. Performed by the The Yardbirds as a cover it features a long instrumental passages of bowed guitar courtesy of Jimmy Page, and dynamic instrumental flourishes. Page has stated that he obtained the idea of using a violin bow on his guitar from a violinist named David McCallum, Sr., during his session days before joining the Yardbirds in 1966. The song was never formally recorded by The Yardbirds, however a live version was included on the album Live Yardbirds: Featuring Jimmy Page under the alternate title "I'm Confused". A live video from the French TV series "Bouton Rouge" recorded on 9 March 1968 was released to the public in 2000. When the Yardbirds disbanded in 1968, the song was re-worked by Page again, this time while as a member of Led Zeppelin. According to Led Zeppelin bassist John Paul Jones, the first time he heard the song was at the band's very first rehearsal session at Gerrard Street in London in 1968. Joining the Led Zeppelin WikiProject. Doing a job on the to-do list. 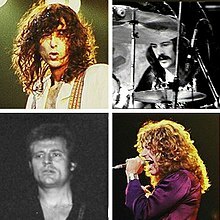 Expanding or improving all Led Zeppelin articles. Keep the news up to date in this portal. Expanding, improving, or reverting vandalism on articles or talk pages concerning Led Zeppelin. The Led Zeppelin WikiProject is a project that helps to assemble writers and editors interested in Led Zeppelin. The aim of this project is to standardize and improve articles related to Led Zeppelin. To become a member of this WikiProject (anyone may join), simply click here - and add [[user|username]]. This is a sister portal of the Music Portal.